Massachusetts Dermatology Associates offers its patients on the North Shore, MA proven treatments for eczema and psoriasis. From the mildest cases to severe disease, we work hard to tailor our patients’ treatments to maximize results. 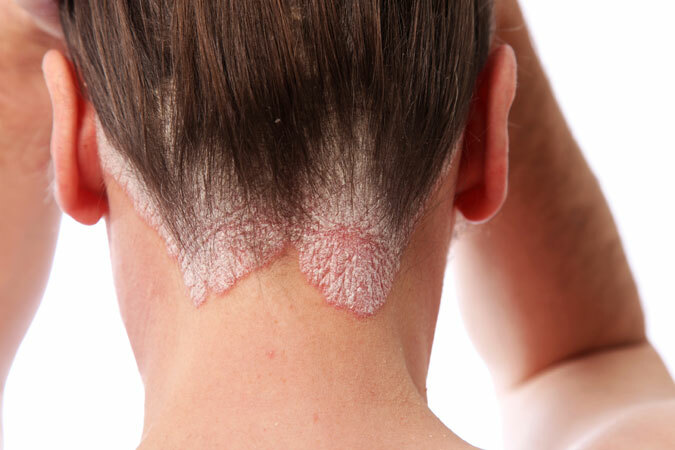 Psoriasis, like eczema, is an inflammatory condition of the skin (and potentially other organs) caused by increased activity of the immune system and resulting redness, scale, and often itch. Psoriasis is not contagious. The cause is not clear, but it tends to occur in people who have a family history of psoriasis, who have recently been infected with strep throat, or rarely after starting certain medications. Symptoms may worsen with exposure to colder temperatures and dry air. Psoriasis of the skin can be associated with inflammation of the joints which may cause irreversible joint damage; therefore worsening joint pains should be brought to the attention of your dermatology care provider and PCP. Psoriasis can also be associated with obesity, diabetes, and heart disease, so it is important to let your primary care physician know that you are affected with this condition. What is the role of topical steroids in the treatment of psoriasis? Topical steroids alone can be an effective psoriasis treatment in mild or moderate cases. These agents have anti-inflammatory effects that are effective in reducing redness, scaling, itching, and irritation. Directions: A thin layer is gently rubbed into the affected areas (red, itchy spots) of skin up to twice a day. Topical steroids should not be used on normal skin. The most useful time to apply these for effective psoriasis treatment is immediately after bathing or showering. Low potency: Hydrocortisone 1% or 2.5% are weak preparations that are safe to use for an extended period of time on most areas of the body and face, avoiding contact with eyes (careful application to eyelids is OK). Higher potency: Stronger preparations such as clobetasol, fluocinonide, betamethasone, desoximetasone, and triamcinolone may be prescribed for a limited time. Do not use these on the face, groin, or inner thigh unless directed to do so (they may produce thinning of the skin if used in these areas). Daily use of these products is recommended for no more than 2-3 weeks per month. It is important to have realistic expectations that psoriasis is a chronic, often lifelong, condition, and while topical steroids and other psoriasis treatments can be effective, the results are often temporary and require continued use over the course of years or decades. I have heard that vitamin D is helpful in treating psoriasis? Is this true? While it unclear whether increasing blood levels of vitamin D improves psoriasis, topical creams containing vitamin D analogs (e.g. calcipotriene and calcipotriol) have proven to be useful adjuncts to topical steroids. A common routine followed by many patients is the use of a vitamin D analog such as calcipotriene twice daily on the weekdays and a topical steroid twice daily on the weekends. When used as directed, vitamin D analogs are extremely safe. Reserving topical steroid for weekends only can be helpful over the long-term to prevent skin thinning. Your dermatology provider will help you to determine if these agents are right for you. My psoriasis is much better in the Spring and Summer. Is there a psoriasis treatment that can help me get through the cold and dry months? Psoriasis will often improve with exposure to light and treatment with narrowband UVB phototherapy is a well-established psoriasis treatment for patients who have not responded to topical therapy. NBUVB is a safe treatment that requires short in-office visits three days per week. It may take at least 6-8 weeks of treatment to appreciate improvement. I have seen advertisements on TV for Enbrel (etanercept), Humira (adalimumab), Stelara (ustekinumab). Are these agents I should consider? Enbrel (etanercept), Humira (adalimumab), Stelara (ustekinumab) are biologic therapies that are self-administered by injection. They tend to induce clearance at similar levels to what is seen with phototherapy. They function by reducing immune function. The advantage of these therapies is that the injections are more convenient for many patients than coming in for light treatments or using topical agents. The disadvantage of these therapies stem from the fact that unlike topical treatment and narrowband UVB light treatment, the immunosuppressive effects are body-wide rather than localized to the skin. Risks include the chance of potentially serious infection and the rare possibility of internal cancer. The cost of these medications is often more than $30,000 per year and often requires insurance authorization. I have psoriasis on my scalp. What are my treatment options? Narrowband UVB phototherapy: The Levia NBUVB phototherapy brush can be used for in-office treatments two to three times weekly for patients who do not respond to topical treatment. Eczema (atopic dermatitis) is a skin disorder that manifests with dry, itchy skin and a red, scaly rash. It can start at any age, often with no obvious trigger. Eczema is not contagious. The cause is not clear, but it tends to occur in people who have a personal or family history of eczema, asthma, or hay fever (seasonal allergies). Symptoms may worsen with exposure to colder temperatures, dry air, as well as with repeated contact with water. Eczema (atopic dermatitis) is different from contact dermatitis in which there is a cause for the dermatitis that can often be uncovered through patch testing. How are moisturizers used in the treatment / prevention of eczema? For dry skin (or skin with active eczema): CeraVe CREAM (in jar), Vanicream Moisturizing Cream, Hydrolatum, or Aquaphor at least twice daily (preferably three or four times daily). At night, you may use socks, cotton gloves, long-sleeved shirts, and/or long pajamas to both occlude the moisturizer and protect your linens. For normal-appearing skin (to prevent dryness) or for mildly affected skin on face: CeraVe Moisturizing Lotion or Vanicream Lite Lotion twice daily. Moisturizers alone can be effective eczema treatment for mild cases. In moderate to severe cases other strategies will be combined with moisturizers for successful eczema treatment. Is it fact or fiction that taking baths / showers makes eczema worse? Baths are helpful in soothing itching and removing crusting (7 days per week; at least once daily). They should be lukewarm. Immediately after bathing/showering (while skin is still damp), apply moisturizers and prescription ointments. If moisturizers are not immediately applied, bathing can worsen skin dryness and irritation. Avoid bubble baths. Cleansers: We recommend CeraVe Hydrating Cleanser, Cetaphil Gentle Skin Cleanser, and Dove unscented soap as well as other mild cleaners. What is the role of topical steroids in the treatment of eczema? Prescription topical steroids are not always necessary and may be advised by your dermatology care provider for successful eczema treatment. These agents have anti-inflammatory effects that are effective in reducing redness, itching, and irritation. Directions: A thin layer is gently rubbed into the affected areas (red, itchy spots) of skin up to twice a day. Topical steroids should not be used on normal skin. The most useful time to apply these is immediately after bathing or showering. Apply moisturizers after topical steroids. What is the role of topical calcineurin inhibitors (e.g. Protopic and Elidel) in treating eczema (atopic dermatitis)? These are often used as second line agents for eczema treatment of body areas such as the face or groin because they have a lower tendency to induce skin thinning. Directions: A thin layer is gently rubbed in the affected areas (red, itchy spots) of skin twice a day. These medicines should not be used on normal skin. Mild stinging may occur but should improve within one week. To decrease stinging, avoid applying to open areas, and continue to use twice daily. Use until skins clears, then discontinue. Restart if rash reappears. The FDA has issued a “Black Box Warning” for these medications, as it is unclear whether there may be a link to cancer (causal relationship has NOT been established). We are comfortable recommending these agents for eczema treatment as long as they are used as prescribed. I have a hard time falling asleep at night. Are there any oral medications that can help with the itch caused by eczema? Oral antihistamines may be somewhat helpful in controlling itching. They are particularly useful at bedtime when itching is usually the worst. They often have the side effect of producing drowsiness and, in rare instances, hyperactivity. These medications should never be used when operating machinery such as an automobile. The most commonly prescribed antihistamine is Atarax (hydroxyzine). Benadryl (diphenhydramine) is available over the counter. They are best given about 1 hour after dinner. The dose may be repeated every 4-6 hours. With continued use, antihistamines may lose their effectiveness, and higher doses may be required; therefore, use of these should be limited to times of greatest discomfort. In certain circumstances, you may be advised to take a less sedating antihistamine such as Claritin (loratadine) or Zyrtec (cetirizine). My eczema is much better in the Spring and Summer. Is there a treatment that can help me get through the cold and dry months? Eczema will often improve with exposure to light and treatment with narrowband UVB phototherapy is a well-established eczema treatment for eczema that has not responded to topical therapy. NBUVB is a safe treatment that requires short in-office visits three days per week. It may take at least 6-8 weeks of treatment to appreciate improvement. Is there a role for antibiotics in the treatment of eczema? Bactroban (mupirocin) is a prescription topical antibiotic which is applied 2 times daily to areas where the skin surface has been disrupted and exhibits signs of mild superficial infection. Oral antibiotics may be needed if the skin becomes more significantly infected. Signs of infection include open and moist areas which may weep, develop crust, exude pus, or have surrounding redness (and sometimes tenderness). The most commonly prescribed antibiotics include cephalexin, dicloxacillin, doxycycline, minocycline, and erythromycin. Should I consider chlorine bleach baths for my eczema? An eczema bleach bath (a bath with a small amount of bleach added to the water similar to swimming pool chlorine) may significantly improve eczema. The bleach bath kills bacteria on the skin which often make eczema worse. This is most effective when combined with other eczema treatments. If properly diluted and used as directed, a bleach bath is safe for both children and adults. For regular tub: Add ¼ cup (59 milliliters) of bleach to a 40-gallon (151 liter) bath tub filled with lukewarm water. Soak the affected areas of skin for at least 5-10 minutes. Gently dry skin thoroughly with a FRESHLY laundered towel (not containing bacteria from previous use) and apply a thick layer of moisturizer. On the evening of bleach baths, to decrease possibility of recolonization, use freshly laundered sheets, pajamas, and towels. My eczema is suddenly MUCH worse, and I would like to avoid taking oral steroids to control it. Is there another option? Wet wraps can be a useful tool in the intensive treatment of atopic dermatitis. They serve as an effective barrier to scratching and increase skin hydration and rehydration, which, in turn, helps promote more restful sleep. Likewise, they act as an occlusive barrier that promotes penetration of topical corticosteroids into the skin, thereby increasing the amount of medication delivered to the affected areas of inflammation.